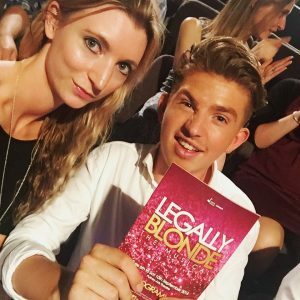 Legally Blonde is currently doing the rounds on the amateur circuit having very recently been released to amateur companies. This popularity is for very good reason as it seems to not only put bums on seats (Cygnet Players run was completely sold out) but attract a buzz about it that not many other shows can pull off. The show tells of Elle Woods who is unceremoniously dumped by her boyfriend Warner as he needs a more ‘Serious’ girlfriend. Elle decides that her best plan to get him back is to follow him to Harvard Law School (like it’s hard?!) and show him just how serious she can be. Things don’t go to plan as when she arrives at Harvard, Warner has moved on with ‘preppy’ Vivienne. In addition to this her lecturer Callaghan throws her out of class on the first day. Ex-student and Callaghan’s assistant, Emmett soon takes Elle under his wing and she comes out fighting eventually proving to all that she is more than a blonde bimbo. Legally Blonde relies heavily on the casting of Elle Woods. 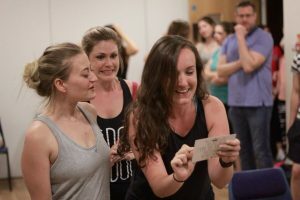 She not only has to look the part (with several references in the show as to how ‘hot’ she is), but have great comic timing, be able to belt out numbers such as ‘Legally Blonde’ and have the audience rooting for her from the first moment you see her onstage. 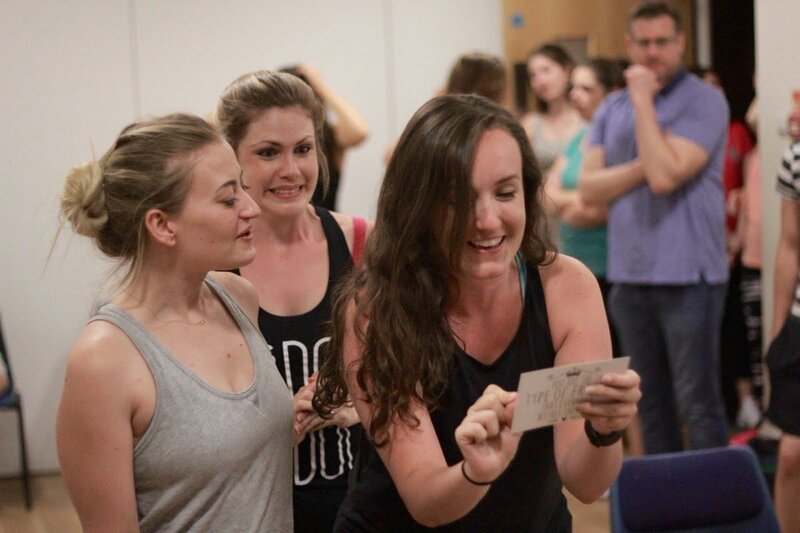 Cygnet Players had all this and more in their Elle, played by Rachel Kitchen. Rachel had the audience eating out of her well manicured hands throughout the show and didn’t put one (consistently) high heeled foot wrong. This part was made for Rachel and a lot of her expressions and loveability reminded me of the original West End Elle, Sheridan Smith. Surrounding Elle was the Delta Nus, lead by Serena, Pilar and Margot (Siana French, Anna Howard & Hannah McKenna-Vickerstaff). Whilst their energy was great and infectious, at times I would have liked a bit more sass from the Delta Nu’s generally. I also found it difficult to distinguish between the main girls so would have liked more personality development from them also. Kate Chesworth played the comedic role of Paulette and once again this was an example of perfect casting. Her facial expressions alone had me laughing along with Paulette, with the Irish section in Legally Blonde remix being a perfect example. Emmett has the difficult job of being geeky enough to cause comments from Callaghan but able to develop into a confident enough person to get a wow when he steps out of the changing room and to stand up to Callaghan in the closing scenes. Mark Stanford pulled all of this off whilst singing some pretty difficult numbers. Legally Blonde is jam packed with dance numbers which include skipping, Irish dancing, cheerleading and of course Legally Blonde’s very own ‘Bend & Snap.’ There clearly were some very talented dancers in the company however the dances needed further drilling by choreographer Della Bhujoo, both with formations and the moves themselves in order to be sharper and create a more polished finish. There were some nice moments of choreography, in particular the Delta Nu choir section in Oh My God which appeared to be the exception to my above comments. This part was uniformed and as a result had a strong impact. The band sounded tight and the musical director Steven Geraghty had done a good job with the cast. The ensemble numbers in particular were strong and the harmonies within them came across well. One major factor of Legally Blonde is the look of the show and costumes are a major part of this. The principals were costumed brilliantly throughout, in particular Elle’s costumes helped her stand out (and give me shoe envy). There was also nice attention to detail with the Salon uniforms. I mentioned above that I wanted more distinguishable personality from the Delta Nu’s and costumes could have helped with this. For example Serena is a cheerleader and traditionally seen consistently in a cheerleader outfit throughout the show but in Cygnet’s version she was dressed the same as the rest of her sorority sisters. Overall this is a fun production which is worth seeing for Rachel Kitchen as Elle alone. It stays true to the spirit of Legally Blonde and they balance the froth on the surface well with its true message of looking beneath the surface. Well done to all at Cygnet players for another success! Legally Blonde is on until Saturday 10th September at Putney Arts Theatre. Click here to find out more about the company. Click here to check out my review of Cygent Players previous production Hairspray.